Recognizing that noise is an unavoidable side effect of aviation, in 1991 the Tucson Airport Authority initiated a Federal Aviation Regulation (FAR) Part 150 Noise Compatibility Program Update for Tucson International Airport (TUS) that limits the impact of aircraft noise on the Tucson community. Since the program’s adoption, numerous policies, abatement, and mitigation strategies have been implemented successfully. 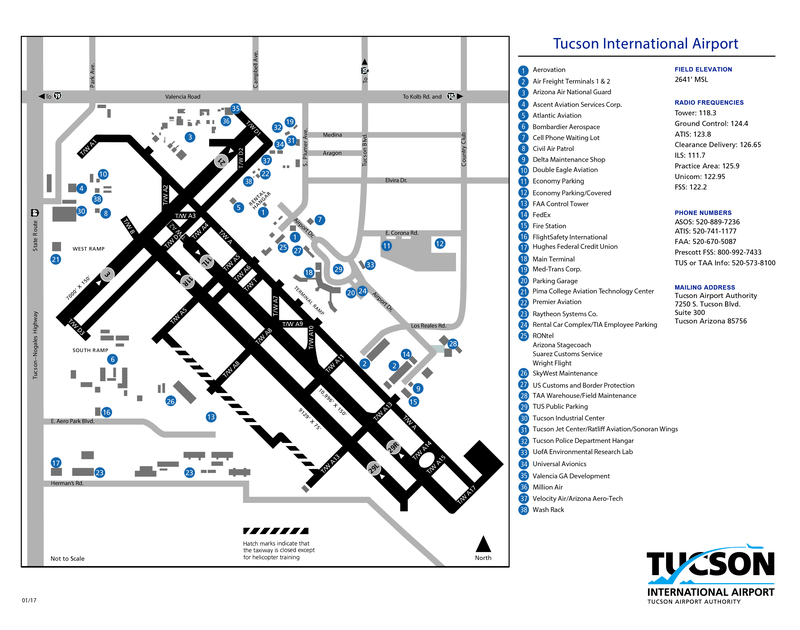 In 2012, the TAA adopted an updated Part 150 Study for Tucson International Airport. The TAA investigates noise complaints to determine if aircraft are operating in violation of FAA regulations or are operating in violation of TAA agreements. If the TAA determines the noise complaint requires action then the appropriate action will be taken with the aircraft operator or TAA will elevate the complaint for investigation by the FAA. The Federal Aviation Administration also investigates noise complaints. Any altitude allowing for an emergency landing if a power unit fails without undue hazard to persons or property on the surface. 1,000 feet above the highest obstacle within a horizontal radius of 2,000 feet of the aircraft over any congested area of a city, town, or settlement, or over any open air assembly of persons. An altitude of 500 feet above the surface, except over open water or sparsely populated areas. In those cases, the aircraft may not be operated closer than 500 feet to any person, vessel, vehicle, or structure. Helicopters may be operated at less than the minimums prescribed in the two preceding paragraphs if the operation is conducted without hazard to persons or property on the surface. In addition, each person operating a helicopter shall comply with any routes or altitudes specifically prescribed for helicopters by the Administrator. In 1988 TAA moved TUS’s main runway, 11L-29R, 1/2 mile to the southeast. This moved aircraft takeoffs and landings further away from populated areas. The shift also increased the altitude of aircraft arriving over populated areas, which keeps the highest noise exposure on airport property. During daylight hours, and contingent upon weather conditions, pilots are asked to land from the northwest and takeoff to the southeast when using TUS’s main runway 11L/29R. During nighttime hours (10:00 p.m. to 7:00 a.m.), preference is given to conducting arrivals from and departures to the southeast when wind, weather and level of traffic permit. Airplanes are becoming progressively quieter. FAA took the first steps to mitigate aircraft noise through codifying 14 CFR Part 36, effective December 1, 1969. Part 36 established the first noise standards which later became a classification system to identify the noise level for civil jet aircraft (presently ranging from Stage 1 to Stage 4) and for helicopters (presently ranging from Stage 1 to Stage 2). Stage 1 would indicate the loudest jet aircraft, with Stage 4 being the quietest jet aircraft. Presently all civil jet aircraft must meet either Stage 3 or Stage 4 noise levels. In 1990, the U.S. Congress ordered the FAA to phase out noisier “stage 2” jets by the year 2000 by passing the Airport Noise and Capacity Act of 1990. FAA began by requiring all civil jet aircraft over 75,000 pounds maximum take-off weight to meet at least Stage 3 sound requirements. Effective January 1, 2016, all civil jet aircraft under 75,000 pounds maximum take-off weight must meet at least Stage 3 sound requirements, if operating in the contiguous United States. FAA has implemented Stage 4 requirements; any person submitting an application for a new airplane type and design on or after January 1, 2006 must comply with Stage 4 sound requirements. Both Pima County and the City of Tucson have adopted formal zoning ordinances in areas exposed to high levels of aircraft noise. These ordinances regulate development that is sensitive to noise. For example, residences and schools are more affected by aircraft noise than a factory. The sound ordinances also require sound insulation for new buildings in which interior noise is a concern. In 2004 the TAA Board of Directors approved an Avigation Easement Policy requesting avigation easement and disclosure statements for any proposed change in plan designation or zoning around TUS and Ryan Airfield (RYN). The area is defined by the Federal Aviation Administration, FAA, as Traffic Pattern Airspace and includes consideration for future planned runways. The policy formalizes TAA’s long history of seeking protections around the airfields to encourage compatibility and quality of life for residents and business adjacent to the airports. Both Pima County and the City of Tucson have made the FAA Traffic Pattern Airspace maps part of the public record as has the State of Arizona Department of Real Estate. From 1992 to 2012, when the program ended, the Residential Sound Insulation Program provided acoustical treatment to minimize noise in neighborhoods near the airport. Funded by grants from the Federal Aviation Administration and the Arizona Department of Transportation, as well as matching TAA funds, the voluntary program retrofitted 1,121 eligible homes and one school with specialized windows and doors and modified ventilation systems at no cost to homeowners. To create a noise “buffer” around TUS and promote compatibility, TAA implemented a land acquisition program targeting property primarily to the southeast. TAA has purchased nearly 3,000 acres of vacant land adjacent to the airport’s original boundary. Often aircraft mechanics must test an engine at high levels while the aircraft is parked on the ground to assure that repairs and maintenance have been successful. TUS has designated that engine runups should be performed on a specially constructed runup apron at the southeast end of the airport, as far from populated areas as possible. The runup apron is shielded from areas around the airport by a dirt wall that absorbs and dissipates the engine noise. One of the noisiest aircraft using TUS is the Arizona Air National Guard F-16 Fighter. The Air National Guard (ANG) has been operating out of TUS since 1956. Today, the ANG base is home to one of the world’s top two F-16 training squadrons. Limiting the use of afterburners for F-16’s – which are extremely noisy – to no more than 10% of maximum allowable aircraft operations. Restricting F-16 afterburner usage to southeast takeoffs, over vacant land, whenever possible. Eliminating ANG flight training or engine runups between 10:00 p.m. and 7:00 a.m.